Description: Mailed to members who received the 2012 desk calendar. This card fixed a typo in the month name, November. This is a list of VGCollect users who have 2011 Club Nintendo Gold Member Reward - 2012 Calendar Replacement Insert in their Collection. This is a list of VGCollect users who have 2011 Club Nintendo Gold Member Reward - 2012 Calendar Replacement Insert in their Sell List. 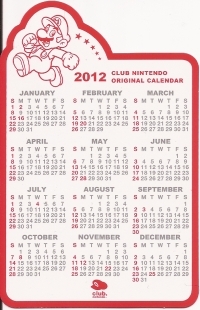 This is a list of VGCollect users who have 2011 Club Nintendo Gold Member Reward - 2012 Calendar Replacement Insert in their Wish List.